It's that time of year again when holiday parties abound, replete with an endless array of sickly sweet, processed treats that nearly guarantee swelling bellies and wider waists (not to mention killer refined sugar hangovers). Over the next few weeks, I'll be posting some recipes for healthy, tasty and easy alternatives to indulge in while still staying on track with your fitness and nutrition goals. 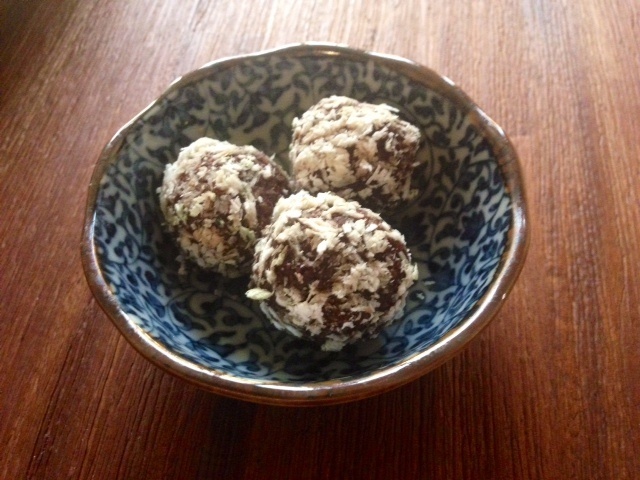 First up is the "Super Simple Turbo-Charged Bliss Ball"- scrumptious bites of goodness that pack a high-energy punch and require less than twenty minutes in the kitchen! 2 tablespoons green superfood powder (I use and swear by Vitamineral Green, which I purchase from Balanced Living. It's pricey, but still far less than a daily Starbucks latte). - Mix nuts, cacao powder, coconut oil, green superfood powder, shredded coconut and chia seeds in a blender or food processor until smooth. - Add the Medjool dates to the mix and blend. You can add a bit more coconut oil if your mix is dry. - Sprinkle fresh shredded coconut over each ball. Alternatively, you can dust them with green superfood powder. - Stick in the fridge for 20 minutes and serve. This recipe makes 25-30 Bliss Balls. They store well in the freezer, are easily transportable, and irresistible! Medjool dates are high in carbohydrate glucose and fructose for energy, as well as dietary fiber, which can relieve constipation and aid digestion. They also contain carotenoid and phenolic antioxidants, which are known to boost the immune system, stave off disease and improve cardiovascular health. Nuts have been shown to reduce cancer, heart disease and other chronic disease. Almonds are high in Vitamin E, which will help keep your skin looking its best. Brazil nuts contain selenium to boost your immune system and heal wounds quickly. Walnuts are rich in omega-3 fatty acids to lower blood pressure and triglyceride levels. Cacao is known to reduce cholesterol in the blood, lower blood pressure and improve your mood. Cacao is chock full of antioxidants to slow down the aging process caused by free radicals. It's also a good source of sulfur for lustrous hair and strong nails. Coconut is truly a wonder food with incredible health benefits, including blood sugar stabilization, healing wounds, and lowering cholesterol. Coconut is also known to increase metabolism due to its medium chain fatty acid content. Chia Seeds are an excellent source of omega 3 fats and are popular for their ability to increase energy levels (many distance runners swear by them). If you're aiming to lose weight, turn to the chia seed- it will help keep you feeling full. Green Superfood Powders are power-packed with high potency nutrients, including antioxidants, minerals and enzymes. I drink Vitamineral Green each morning instead of coffee for an amazing energy boost- it also makes my skin look brighter (no, they don't pay me to write that. I really swear by the product).